Ingredients of animal origin: chicken (43%), turkey (20%) and salmon (2%). Vegetables: yellow peas, sweet potatoes, beet, spinach, pumpkin, carob and tomato. Fruits: apple, pomegranate, blueberries, cranberries and citrus. 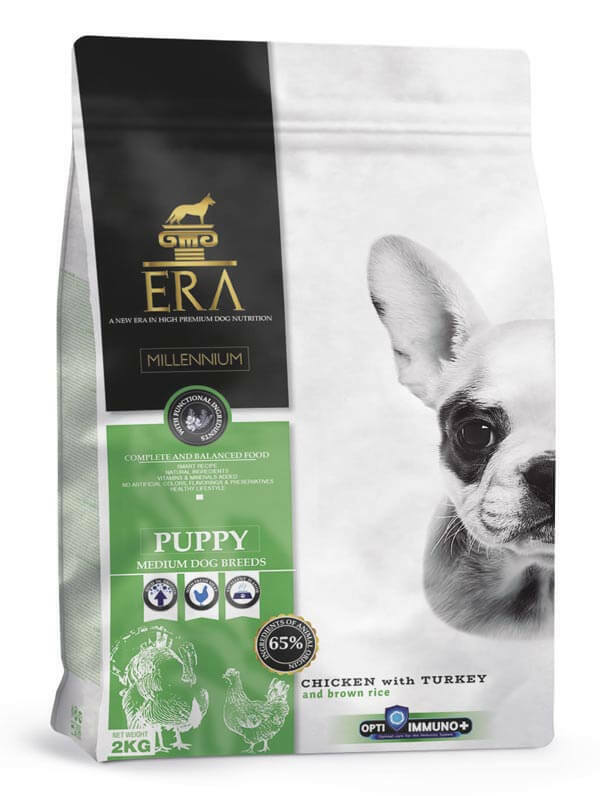 Complete balanced food for puppies (suitable from weaning until 9-12 months) for medium breeds (10-25 kg) and their nursing mother dog. COMPOSITION: fresh chicken meat (25%), dehydrated turkey (20%), whole brown rice (12%), chicken fat (9%, preserved with natural tocopherols, source of vitamin E), dehydrated chicken (6%), yellow peas, sweet potatoes, apple pulp, hydrolyzed chicken liver (3%), pea protein, salmon oil (2%), dried beet pulp, linseed (1.5%), dried spinach, pumpkin, dried carob, tomato pulp, sea algae (Ascophyllum nodosum, 0.4%), minerals, pomegranate (0.2%), blueberries (0.2%), cranberries (0.2%), glucosamine (0.026%), yeast (a source of mannan-oligosaccharides/MOS, 0.02%), citrus extract (0.02%), chondroitine sulphate (0.016%), chicory root (a source of fructo-oligosaccharides/FOS, 0.01%), yucca extract, marigold (Calendula officinalis, 0.01%), green lipped mussels (0.005%), milk thistle seed (Silybum marianum, 0.005%), coneflower (Echinacea purpurea, 0.005%), thyme (Thymus vulgaris, 0.005%), rosemary (Rosmarinus officinalis, 0.005%). PACKAGE WEIGHT: 2 Kg. / 12 Kg. Ensure fresh and clean water is always available.